GARY LADD (LADDIE) BIEHL, 20, Lagro RR #l, l964 graduate of Northfield High School was killed in action against hostile forces near Huong Hoa, Vietnam, May 3, 1967. He was a lance corporal and member of the Third Marine Division. Before going overseas he was at Paris Island, S.C. and Camp LeJeune, N. C.
WILLIAM VICTOR BRINDLE, 18, born in Wabash September 18, 1948, was an airman apprentice in the United States Navy. He died July 29, l967 aboard the aircraft carrier USS Forrestal. Fire broke out aboard ship when an A4 Skyhawk planes fuel tank was punctured. This was the worst combat disaster at sea since World War II. Brindle was a l966 Wabash High School graduate. MAX L. BRUBAKER, was a private first class in Company B, First Battalion, Second Infantry, First Inf Div. He died of multi-fragment wounds on August 25, 1966 in Binh Duong Province, South Vietnam. He had been in Vietnam for five months. He graduated from Manchester High School in 1964. DANIEL R. FULWINDER, Marine Sgt., 22, was killed in a helicopter crash January 8, 1968 on a hillside at Dang Ha, Vietnam. He was a radio and radar operator and repairman. He had volunteered for the flight at the last minute. H was a graduate of Wabash High School entering the service in June of l964. He had training at Camp Pendleton, Ca., and Cherry Point, N.C. He then returned to California for advanced guerrilla training before going to Vietnam Feb. 8, 1967. JAMES DANIEL HIPSKIND, 23, died at the Naval Hospital in Charleston, S.C. from injuries suffered in an automobile accident February 16, 1968. He had been in the Navy for almost four years and was scheduled for discharge in two months. MAX ARDEN JOHNSON, 21, Private First Class serving with Company B, 1502 Infantry, 101 Airborne Division, was killed in action in Vietnam March 21, 1969. He entered the service June 3, 1968, trained at Fort Gordon, Georgia and had been in Viet nam since November l, 1968. He was a graduate of Manchester High School. EVERETT GENE MILLER, 33, STAFF SGT., he graduated from Wabash High School in 1952 and enlisted in the Army that same year. He saw previous service in Germany, Korea and Hawaii. He was killed in action in Vietnam January 29, 1966. TOMMY R. MILLER, 22, Hospital Corpsman,United States Navy, was killed in action in Vietnam March 5, 1966. His death was due to a gunshot wound received in the vicinity of the Quangngai Province of Vietnam. He was assigned to the 2nd Battalion of the 4th Marines. He joined the Navy in January of 1964 and had served in Vietnam for ll months. He graduated from Laketon High School in 1961. LOREN MORFORD, 22, was fatally wounded September 6, 1967 in Vietnam by small arms fire. He was drafted into the Army Nov. 15, 1966. He completed his nine weeks of advanced infantry training April 7th at Fort Polk, La. His last week of training at Fort Polk was spent in guerrilla warfare exercises. During his guerrilla training he lived under simulated Vietnam conditions for five days, fighting off night attacks and conducting raids on "enemy" villages. He was taught methods of removing booby traps, setting ambushes and avoiding enemy ambushes. He had been in Vietnam for four months. He left the United States for duty in the war zone April 29. He was a graduate of Manchester High School in 1962. FREDERICK LEROY NUTTER, 24, USN, he had been in the Navy for eight years. He enlisted in the Navy when he was 17 years old, trained at Great Lakes Naval Base and was with ground forces in Vietnam. This was his second tour of duty to Vietnam. He was killed in action in Vietnam in October of 1970. RANDALL LEE (RANDY) PELL, 23, SGT., was on his third tour of duty in South Vietnam and was killed while he slept in his quarters at DaNang April 8, 1970. He was reportedly hit by multiple fragments from a rocket. He was with the maintenance office, First Marine Air Wing, Marine Air Group ll. He enlisted in the Marines Nov. 12, 1966. His training was at Camp Pendleton and at Memphis, Tn. He graduated from Wabash High School in 1964. He also attended Indiana State University. 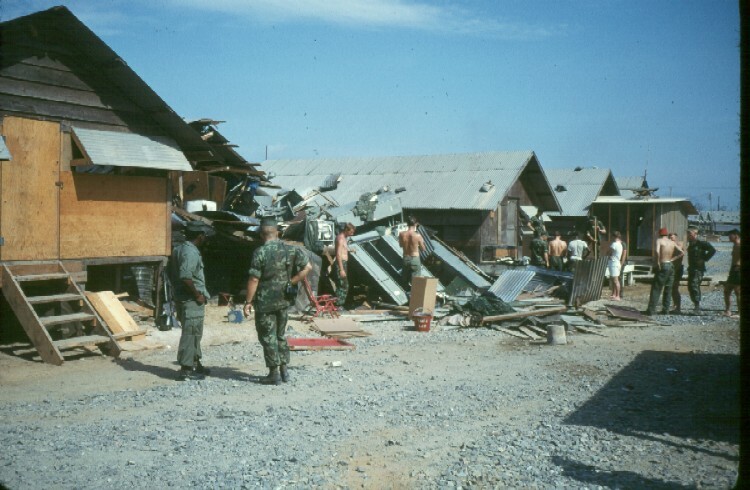 Photo - Randy's destroyed quarters by Charles "Mick" McBride. VICTOR L. POOR, 19, private first class, Company K 3rd Marine Division, 3-9 Battalion. He sustained fragmentation wounds to the head and body from hostile grenade while on patrol February 25, 1969. He died in the vicinity of fire support base Cunningham, near the Laotian Border approximately 25 miles south southwest of Quang Tri, Quang Tri Province. he graduated from Southwood High School in l969. ROBERT STEVEN RAINES, 25, Sgt., was killed in Vietnam November 3l, 1969. He was on his third tour of duty in Vietnam. He was born and raised in Wabash. He was posthumously presented with the Military Merit Medal and Gallantry Cross with Palm. ROBERT L. SOWERS, 49, Col., chief Air Force adviser in the Mekong Delta, fighter pilot WW II and Korea with 62 combat missions in Korea. Received Distinguished Flying Cross with 2 oak leaf cluster; Air Medal with 20 oak leaft clusters; and Air Force Commendation Medal. Died when his UH-l Helicopter crashed 80 miles south of Saigon in April of 1972. DONALD VANCE, Sgt., died of spinal meningitis in Okinawa. He was stationed with the 895th Military Police. He had graduated from Chester High School in 1954 and has been with the Army Military Police for l0 years. He was stationed in Germany for 3 ½ years, in Korea for 1 ½ years and in Okinawa since November. He died in March of 1966.